I didn’t get round to writing the post about our trip to Derbyshire at the end of January, because I was waiting for Pete to put his photos on Flickr, but he hasn’t, so I’ve stolen this one from his Facebook feed. That’s me on the far right bedecked in purple and yellow ribbons. 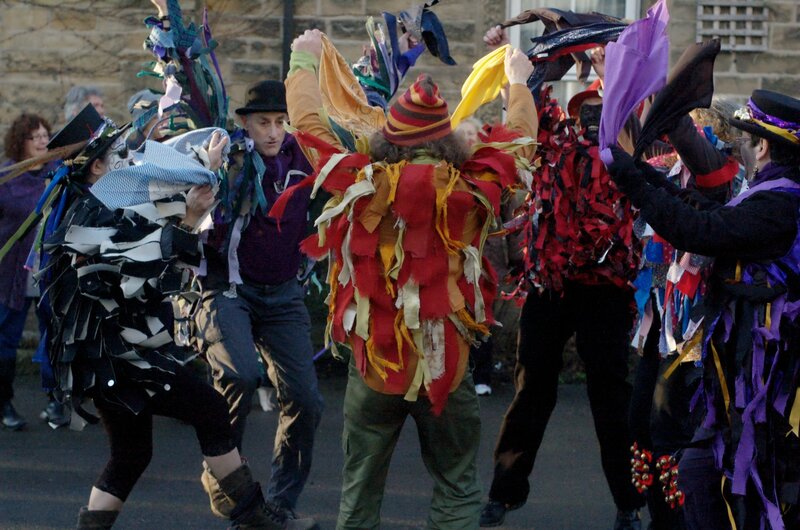 Anyway, so … off we all went to Freaks in the Peaks, a sort of travelling Morris collective/workshop; about ten of us from Rackaback went, in a sort of works outing, and we rented a pair of cottages in Eyam to accommodate us. We all drove down on the Friday afternoon – we got there first, in daylight, and I was glad we did, as big fat snowflakes fell from the sky in the early evening, and then the ice came, and it was bloody treacherous. But the cottages were snug and warm and so that was OK. Pete and I stopped in Matlock Bridge on the way down, where the rain came down sideways and it was freezing, and the village was closed anyway due to winter, and then for a cream tea at Chatsworth, so we were well fed. So that was it, really – we had toast and jam in the little tea room for Sunday breakfast, and packed up the cottage. Some Freakers were walking up the hills to the next village, but we decided we’d drive up there, and we had a nice walk for a couple of miles, although it was a tad on the chilly side. A lovely weekend, all told, and we will be doing the next Freaks in April in Tideswell in Derbyshire. Previous Previous post: Don't be evil?